How much longer can North America ignore Stephen Chow? His amazing Shaolin Soccer became the highest grossing Hong Kong-made film and was completely mishandled by Americans. Kung Fu Hustle is even better and has already surpassed his previous film's box office record. Is this the film that will make the rest of the world take notice? Sing (Chow) and sidekick stroll into a run-down village posing as members of the powerful and feared Axe Gang, and attempt to bully the locals into offering kickbacks like free haircuts. It's apparent that this village isn't as weak as its buildings appear and contains numerous martial arts experts. Good thing, because the real Axe Gang catches wind of Sing and his friend, and soon their heads are at stake at the hands of Brother Sum (Kwok Kuen Chan). The battle sequences will have your eyes glued to the screen, especially when two creepy musicians shoot devastating sound waves through their stringed instrument. 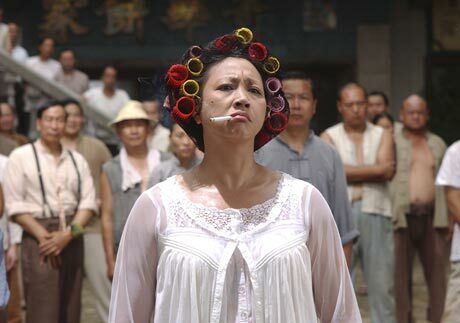 But it's not all flash; Kung Fu Hustle contains the creativity that doesn't show up in your standard action flicks, balancing its violence with absurd comedy that borders on Looney Tunes-ish. Another great ingredient is the level of characters. Just when you think the village has found its heroes, they fail and it's up to someone else to step up, and in most cases it's the most unlikely candidate. The greatest player in this piece comes from the amazing performance of Qiu Yuen as the foul-mouthed Landlady even the Axe Gang must answer to. Yuen is amazing in every scene, which is remarkable considering Chow pulled her out of a 30-year retirement.